Choices. Life is all about choices. God gives us free will to pick and choose how we want to live. Most choices we face are mundane. White bread or wheat? Coke or water? In the short term there isn't much of a real consequence. In the long term there might be more severe consequences. Coke may taste better than water and be quite thirst quenching but it can rot out your stomach lining and teeth over years of drinking it. Every choice has a certain consequence that goes with it be it positive or negative. Some choices are very clear and distinct while others are more difficult and blurred. Same goes for elections and who we choose to vote for. 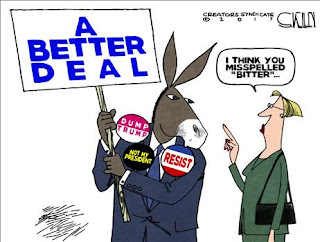 With the midterms this November there will be a choice between a bitter deal or a raw deal. 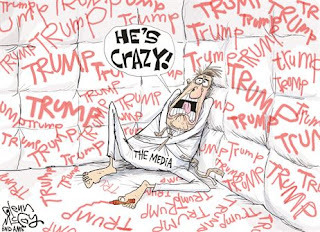 When CNN's Jim Acosta says that the press is not the enemy one has to chuckle just a bit. This would be the same press who had an eight year love affair with President Obama and completely gave that administration a big wet kiss day in and day out. Then the unthinkable happened. Hillary Clinton didn't get to take the throne even after the media did all they could to pave the road and cheerlead her on to what they hoped would be her inevitable victory over Donald Trump. So they decided to go from being the adoring fans of the previous administration to being petulant sniveling resistance fighters with a single goal of undermining a duly elected president. In the minds of the progressive elites in the press they are just freedom fighters these days. Glorious as it sounds they have succeeded in making their profession a joke. They have succumbed to their deep liberal biases and beliefs and succeeded in becoming derelict in their duty as journalists.